June 10th (evening), a Tweet said "It's a warm, windless night here in Phuket, but the forecast does seem to be getting wetter and windier as from tomorrow #calmbeforethestorm"
June 11th "Mostly blue skies, some dark clouds and a few spots of rain this morning"
June 12th "It's a grey, wet morning in Phuket ... Some strong breezes blowing too." 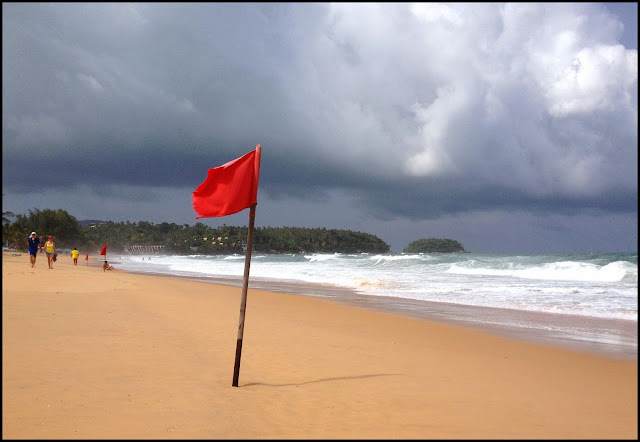 By the 12th, it was looking rough at the beaches and the red flags were flying. 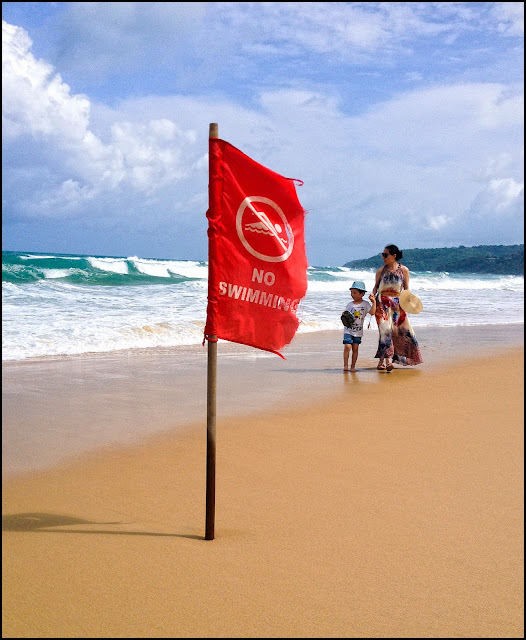 The red flags mean "No Swimming". If you see big waves, don't swim. It's not just the waves, but there can also be rip currents. 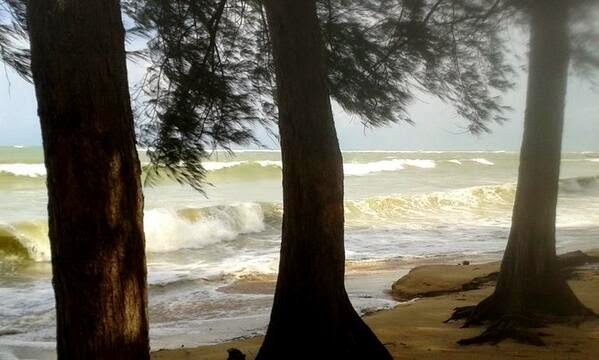 June 13th "a windy night, big waves at Karon beach again this morning, but the sun is out :)"
(above) at Nai Yang beach, June 14th, photo by @Phuket_Bukit on Twitter. June 16th, a Tweet that shows the changes in daily weather in low season "Phuket weather report .. yesterday was ****ing hot, last night a bit wet and this morning grey and hazy." June 17th "Weather this morning - it's sunny and the wind has died down. Looks like a lovely day ahead." June 18th. Oh and the World Cup started a few days ago. As an Englishman, I decided wisely to ignore it and not wake up in the small hours of the morning to watch my country. Above, at Bang Wad Reservoir on the 18th .. I often go here for morning exercise. June 20th "Another lovely sunny low season morning in Phuket"
I had a day off and went into Phuket Town in the afternoon, dropping the kids off for art class. We visited the Phuket Indy Market, parking near the dragon statue (below). June 21st "Waking up to the sound of rain ... Yesterday was hot and sunny. 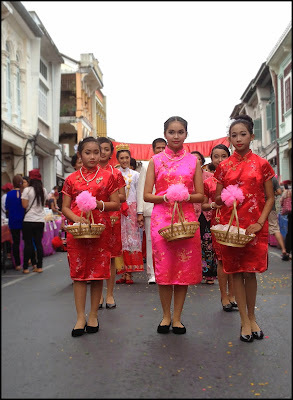 Never know what you're gonna get in low season :)"
June 22nd - another day off :) Well, in the afternoon my wife took our daughter to the dentist and I took our boy to Phuket Town to check out the Baba Wedding street parade. Had a drink first at Eleven Two and Co., then wandered up Thalang Road where the weekly Sunday Walking Street market was taking place. June 23rd "Grey start to the day, but dry for my morning 6.5km walk - a heavy downpour with lots of wind followed a bit later. Now just grey again." 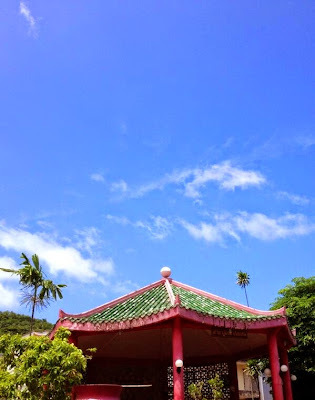 (above) June 24th blue skies over Karon beach .. this little shrine is right outside Sunrise Divers Karon Beach Dive Centre. June 25th - another lovely sunny day, but with big waves at the beaches. Them big waves .. by all means take a walk on the beach, or catch some rays, but don't swim. June 26th (today!) - another mostly sunny day with big waves! Like it or not ... we need more rain here. In the afternoon I was at Karon Beach as I'd seen in the Phuket Gazette that Dr Robert Brander of the University of NSW would be giving a talk about rip currents. Well, at least a few people showed up. The Phuket Gazette had a video camera rolling so I hope to see a report online soon. (above) At Karon beach this afternoon. 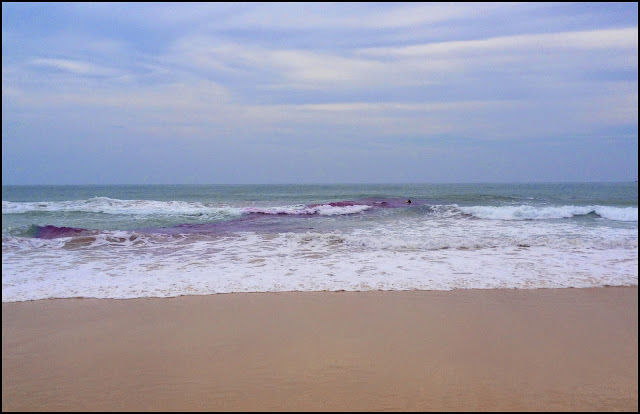 Purple dye (actually potassium permanganate) added to the surf zone shows the location of the rip current. Forecast : Who knows! Low season weather in Phuket is random. I see that 2014 could be an El Niño year, so weather patterns could be abnormal. If you're coming, enjoy! See you in Phuket!